This is the site of the first full-fledged studio for Walt and Roy Disney where such characters as Mickey Mouse, Donald Duck and Jiminy Cricket were created. It was the site of the creation of the early Disney animated features such as Snow White and the Seven Dwarfs, Pinocchio and the early work for Bambi. The original studio was constructed beginning in 1926 after Walt and Roy Disney bought a single lot on Hyperion Avenue and expanded that into almost half the block. The animator’s school was constructed across the street in 1936 and was where the Disney Company taught young animators how to draw the various characters. 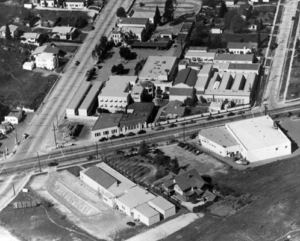 The studio moved to its present site in Burbank in 1940 and the animator’s school building was relocated to the Burbank lot, the only structure that was moved from this original Disney studio.